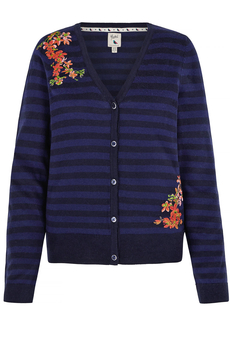 Yumi Floral Embroidered Stripe cardigan. In a soft wool blend, it features pretty embroidered flower detailing, long sleeves and button fastenings through front. Is approx. 58cm in length. Winter collection. Composition: 8% Wool, 47% Polyester, 25% Acrylic, 20% Polyamide. Color: Blue.